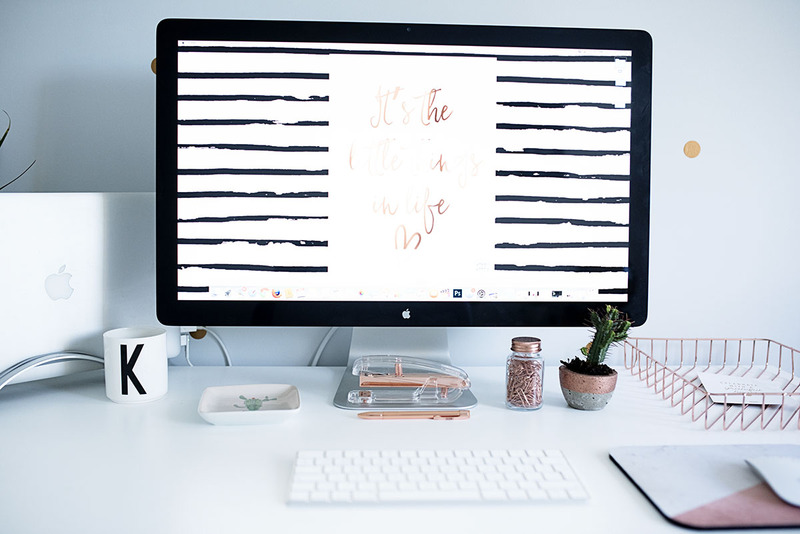 If you’ve been reading this blog for any length of time you will know that I absolutely LOVE an interior project. We moved into our relatively small three bedroom house almost eight years ago now and for the first few years we did nothing, bar gave everywhere a lick of paint and replaced the carpets. We just couldn’t afford to put our stamp on it, then Mads came along, then Jon got made redundant and it just wasn’t the right time. 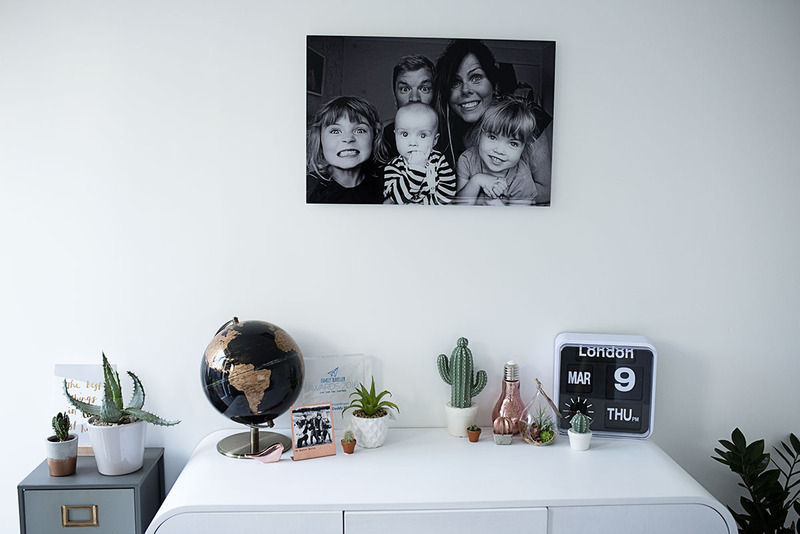 But over the last couple of years we have spent a great deal of time and effort turning our house into a home that really suits our style and above all is full of love as our little family grows. We have renovated our bathroom, our kitchen, added an extension (which was literally a dream come true and I still can’t believe it is ours sometime) and even had a little garden makeover. When we discovered we were pregnant with our baby boy one of our first big concerns was what we were going to do about our work/living situation. Both Jon and I work from home and for the last couple of years we had a little home office in our third smallest bedroom. With the girls already sharing a room, there wasn’t really space for our much planned new addition. 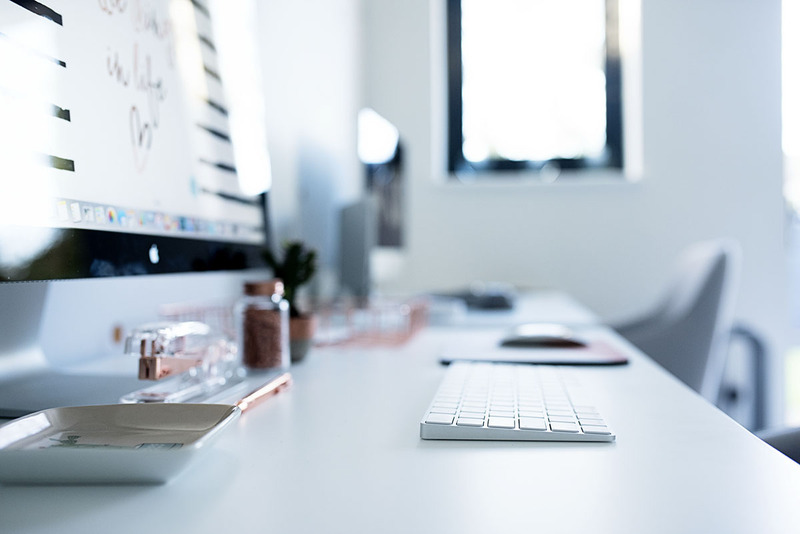 We initially started looking at renting a little office in our local area, but it was so expensive even just for a work station in a shared office block. Jon decided we should look into a possible garage conversion, but my initial thoughts were that it would feel dark and cave like, with no light. We got some quotes from a local carpenter, plus a couple of builders (who were ridiculously expensive) and decided upon the carpenter, who would create a little office from just over half of our garage. Finally the box and initial shell was up and I could start the fun part- planning the interior. I decided on a copper and grey theme, mainly cause I love the way they look together. Our new office has been finished nearly 3 weeks now and we are both utterly thrilled with it. It’s done wonders for Jon as before myself and the children often disturbed him during the day when he was upstairs working, but now he can shut himself away and almost feel like he has ‘gone to work’. It’s such a lovely bright space considering how small it is, our builder added a new glass door where our old rotten wooden door used to be, and he also added a window too. It sounds silly but I can’t explain how proud I am that we have been able to do this to our home, when we first moved in we had some such tough times financially where there were some months when we couldn’t afford to pay the mortgage, so every little thing we have done to it makes me feel so grateful and proud. Here is a little tour around our new office, there’s also a video at the bottom too…. This is what you are greeted with as you come in the office, it’s small but a perfect sized space for both of us. 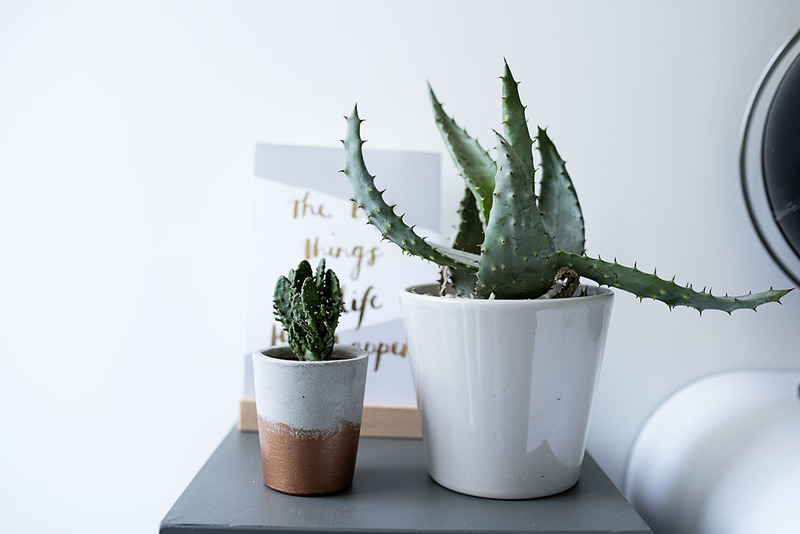 We wanted to make the space quite bright and calming, with lots of touches of greenery, mainly because I am a little obsessed with cacti and succulents. 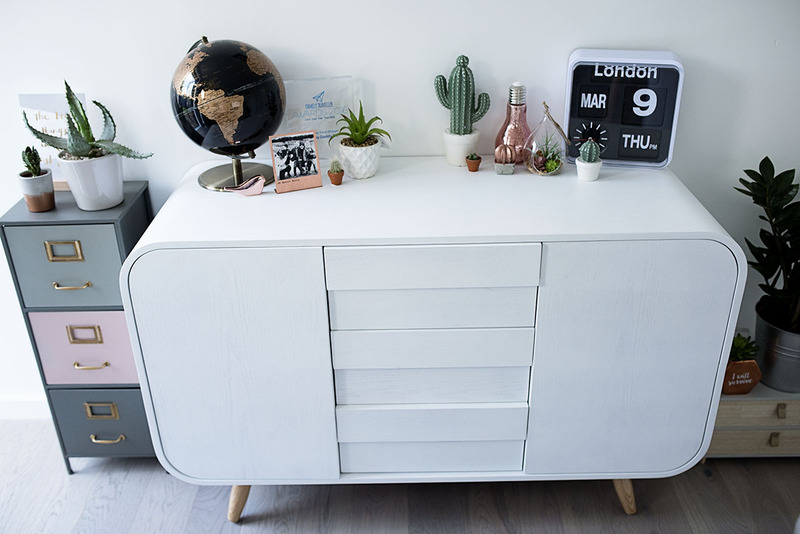 Our sideboard is from made.com and I just absolutely love it- I love the retro styling with the different coloured oak legs as it it reflects my style perfectly. I had great fun adding all the trinkets on the top of it. 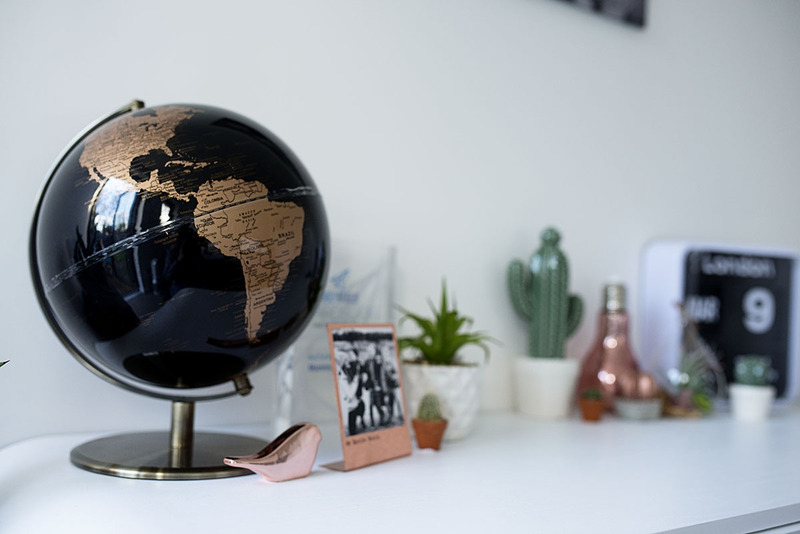 For a long time now I have wanted to get a really nice globe, to reflect our love of travel and also because I had one growing up that I used to love looking at with my Dad. 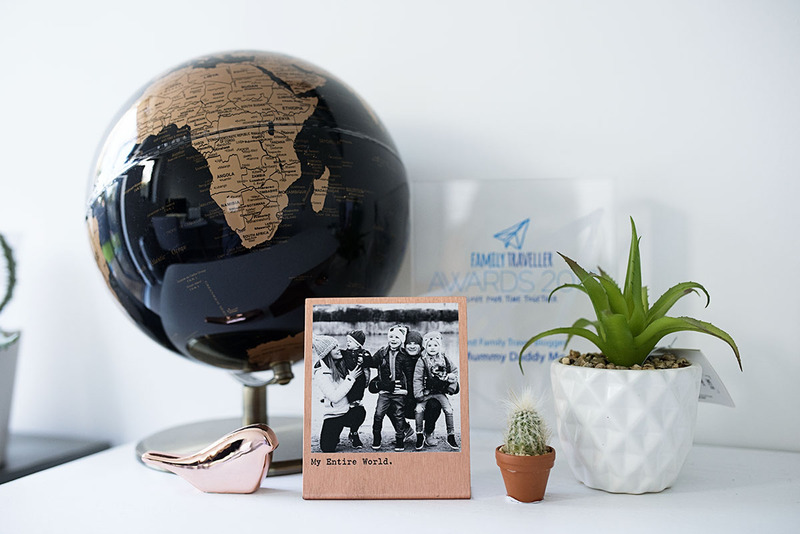 I found this lovely little copper photo frame on Not On The High Street, they etch a photo on top which looks lovely. 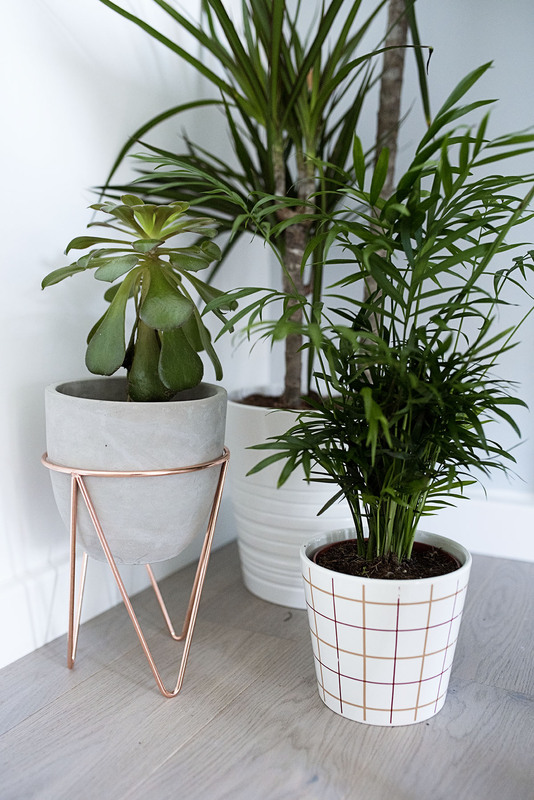 The succulents are from a variety of places, the large geometric one is from New Look- weirdly New Look has some amazing interiors stuff for a really good price. I tried to pick little things that reflect us as a family, hence the travel references and the little copper bird cause we call our baby boy ‘our little bird’. Sainsbury’s weirdly also have a fantastic range of interiors this season, lots of them in a copper theme. 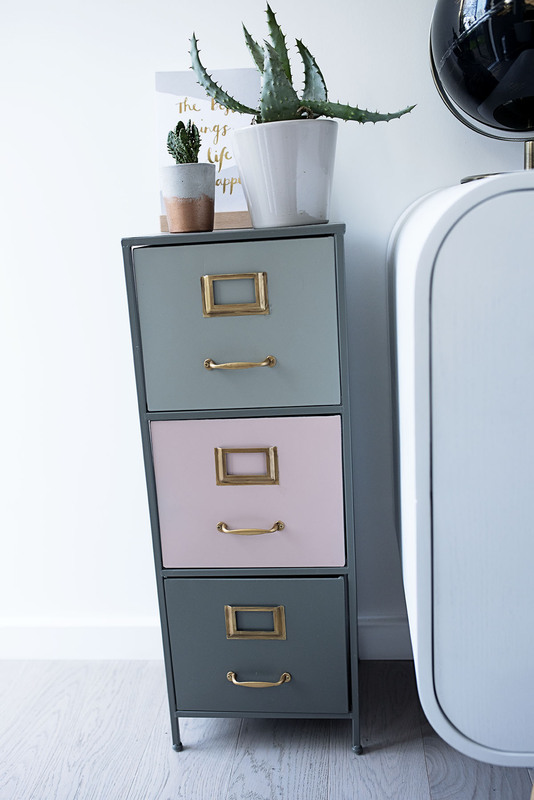 I picked up this little set of drawers, originally for my desk, but then I decided it was too big for on there so I sat it down on the floor. I think it looks great with some plants on top of it. 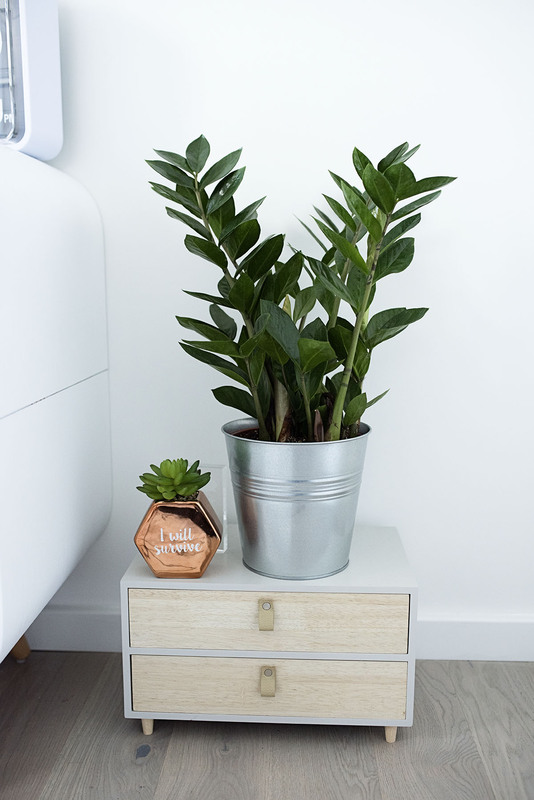 The I will survive fake plant is again from New Look (still seriously random how good New Look is for little interior gifts!). I don’t think I will ever get bored of succulents, I just love them. 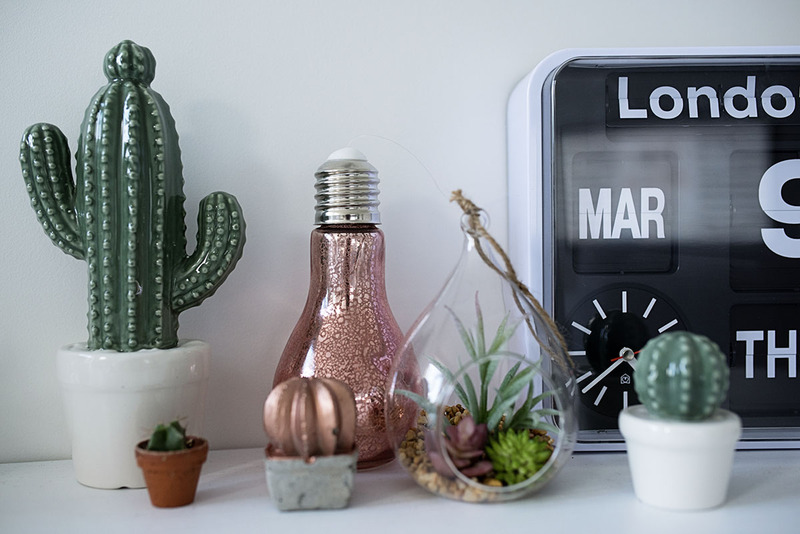 The little concrete one is again from Not on the High Street, while the fake terrarium and the light bulb (which has fairy lights in and is battery operated) are from New Look again. The analog clock is from Habitat and we’ve had it a couple of years now but I still love it. I love this corner of the room with it’s variety of different plants, either from ikea or our local garden centre. I absolutely love my desk. In our old little office space we had a joint double desk which I loved, but Jon found it very hard to work on because it was so narrow and it ended up giving him a bad back so his one request was that we got new ones. We found these on made.com and had to wait 15 weeks for them, but they were worth the wait as I love them. 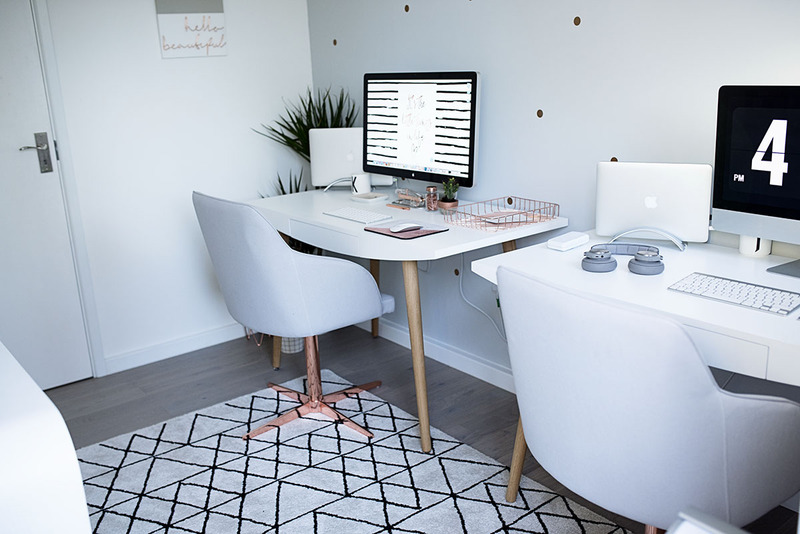 I also adore the copper and grey office chairs, Jon and I argued about these because he thought we should get a more sensible office chair, but as soon as I saw the copper bottoms I knew that I had to get them. They are so beautiful and I never thought I would say that a chair is beautiful! Our rug I got for an absolute bargain from La Redoute, it should have been £99.00 but I got it for about £30.00. I wanted to make my desk quite clutter free so I only have a few trinkets out on display. 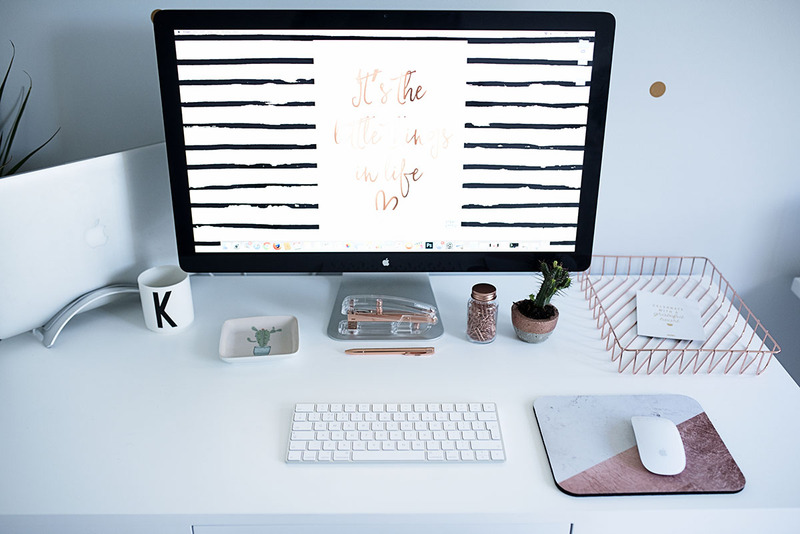 If you haven’t checked out Kikki K before and are a stationary fan, you really need to because they do the most lovely things. I got the copper wire tray (which usually houses my diaries and notebooks) and the stapler from there. The little paperclips were again from Sainsbury’s. I use that little cactus tray to put my many memory cards in as I am always losing them. I love how Jon and I’s desks are the same but they both reflect our style. Jon’s is very plain, bar our doorbell (we bought one of those cheap doorbells you can carry about with you as otherwise he was missing deliveries when we both out!) and his headphones. So there you have it, our lovely new office space. I still have to pinch myself that we have this little room. 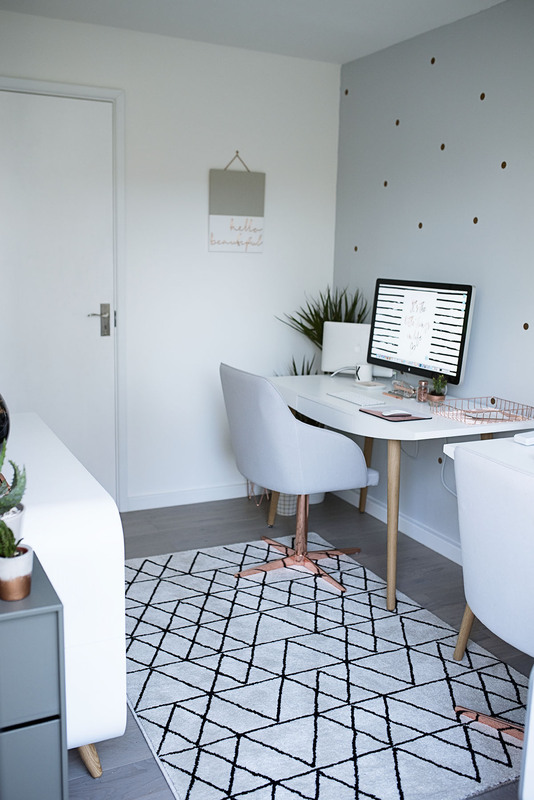 I am so glad I listened to Jon and went for a garage conversion instead of shelling out on expensive rent each month, when he first suggested I really couldn’t imagine it, but it has worked out really well and we love this new space. At the moment we don’t tend to go in there together at the same time as of course we wouldn’t leave the children in the house on their own, so Jon tends to go out there during the day and I will occasionally go out in the evening. But all too soon in a couple of months it will be time for our baby boy to go to nursery and then two days a week we will get to be out there together. 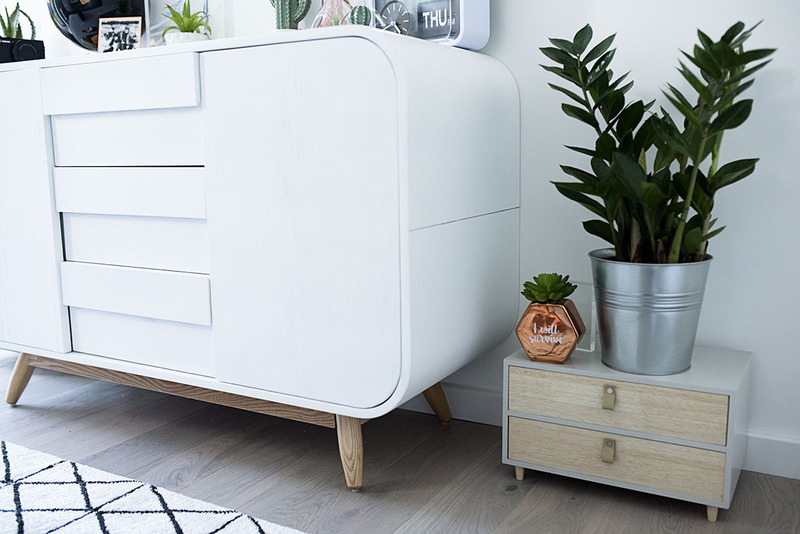 You can check out the rest of our interiors posts here. What a stunning office, although I expected no less to be honest. Your home is gorgeous. 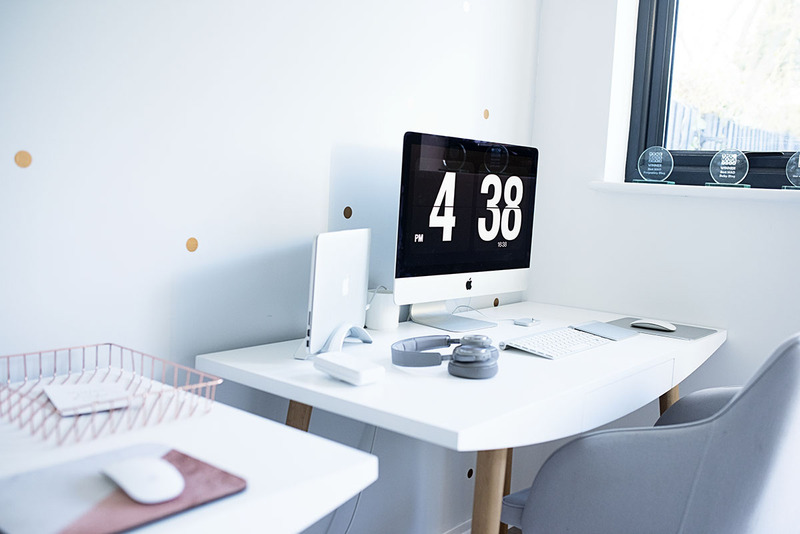 I love the desk space and the units are brilliant. We’re thinking of converting our outhouse into an office space for both me and my husband so it’s great to see how well it can be done. 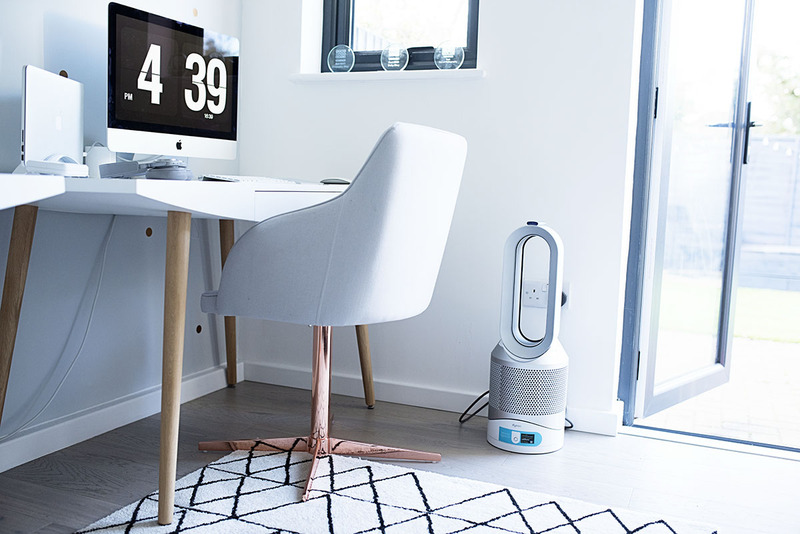 Love the Dyson idea too, very clever! 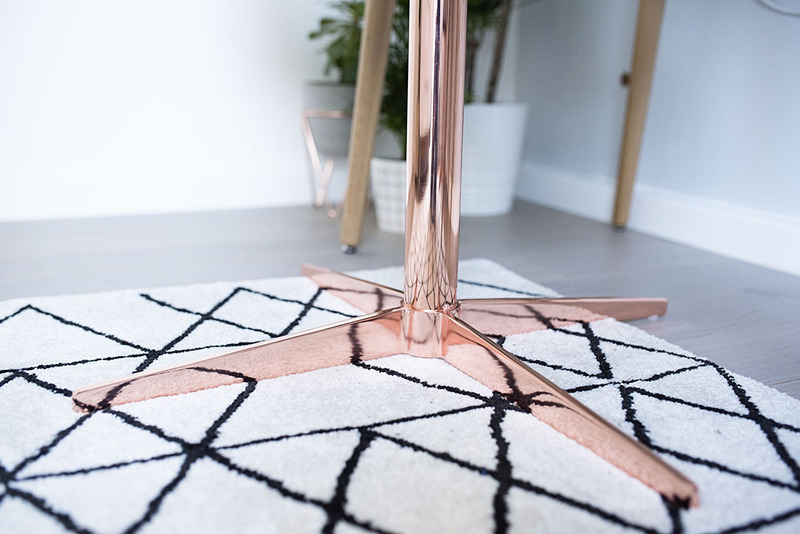 LOVE this interior theme – the rose gold bits are gorgeous. You have wonderful taste Katie! And also, knowing that it took you a few years before you had the spends to decorate how you’d like gives me hope for the future… we’re still stuck renting at the moment but one day I dream of having our own home to decorate and adore. Oh my goodness this is AMAZING. I love the space you have created for you both to work in. It’s beautiful. Funny enough I just mentioned last week too that I redid our back sitting room in copper and grey and mixed metallics. It’s such a trend at the moment. I was so excited to get our new grey couch and start adding copper to the room. That globe is awesome. 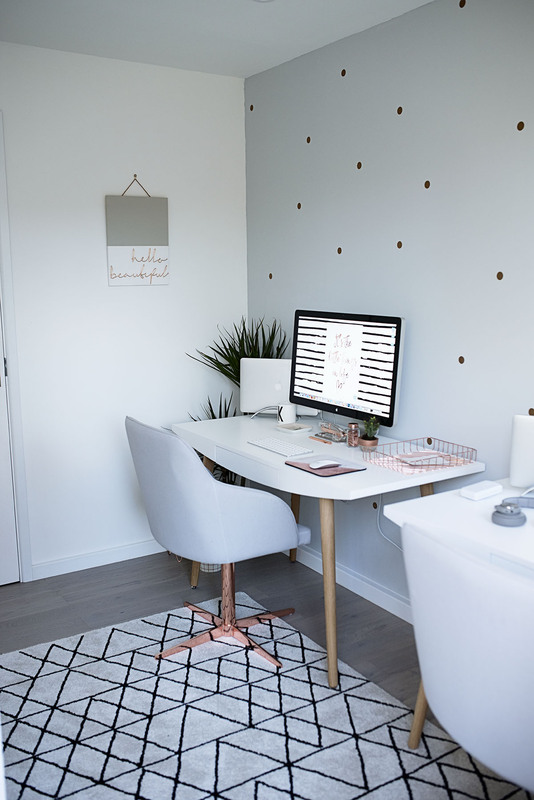 I love the Scandinavian look and vibe here and those rose gold dots on the wall are ace!!!! It’s all about the metallics in true interior design fashion you have created yet another amazing gorgeous room in your home. Thanks for the tour!!!!! Serious office envy! 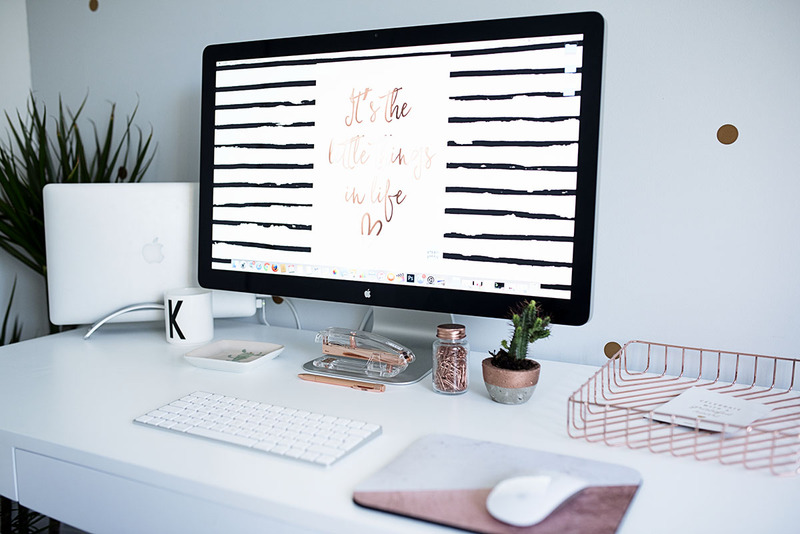 I love the copper… would love a room that was dedicated to work at home! I love your office. It looks so elegant. White, gray and copper are very nice colors to mix with. Can’t tell this is from your own garage. Such an inspiration!